Thank you to the following families and business for partnering with our classrooms for continued student success. Come out and enjoy a movie with you family, and friends on Finley Field right here at Gulf Beaches on Friday March 29th at 7:00PM sponsored by PTA. and come ready to show what you know. Please see the lunch times below for the days of testing. Households which are impacted by the partial government shutdown, that is a loss of income may apply for school meal benefits using their current income situation. The new information will be used to determine eligibility for free and reduced price school meals. That eligibility will be good for the remainder of 2018/2019 school year, plus the fist 30 days of the 2019/2020 school year. When signing onto campus to have breakfast or lunch with your child(ren), please be reminded that this privilege is limited to this purpose and the interaction with your child(ren) only. We provide the outdoor picnic area where we encourage you to enjoy a meal with your child(ren). Thank you for supporting our Safe School Environment. Please refer to the map below to see the flow of our car circle in the morning and afternoon. Remember the safety of everyone is our number one concern, and with your help following this traffic flow we can make sure that everyone is safe. 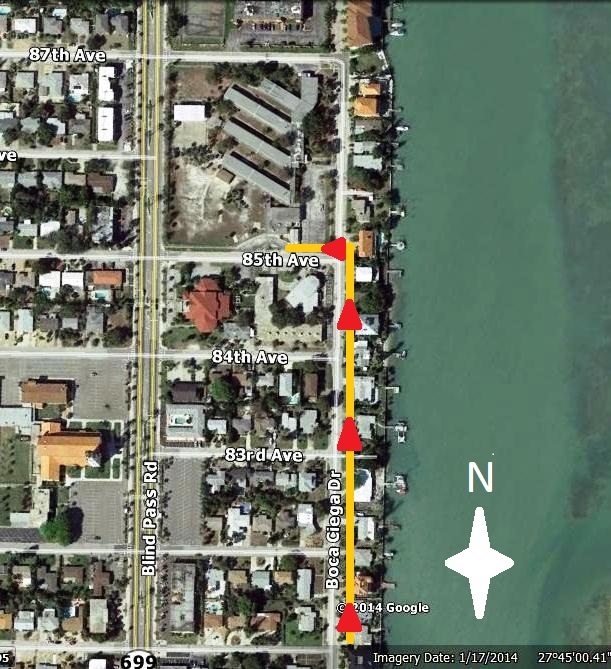 Please notice that No Parking Signs have been placed on the North side of 85th Avenue, between Boca Ciega Drive and Blind Pass Road. Please obey all posted signage and help us keep students and staff safe. Also please remember to use a crosswalk anytime you cross a road, it is the safest way to cross, and also teaches our students to obey traffic rules. Student hours are 8:45 am - 2:45 pm. Students will be allowed on campus for a no cost breakfast beginning at 8:15 am. Remember to get a good nights sleep each night. Once it processes and a successful connection is made, the pcsb.org home page will open and you can now access the internet and internet-based apps (like Clever). *Note: Content Keeper will always make you login after 24 hours. If you are having trouble getting the Content Keeper login window to load, try these troubleshooting steps. FINSS (Future Innovators’ Network for Student Skillsets) is a group of teachers, parents, and community members who network and share their knowledge and expertise with classrooms! As part of our school curriculum, Project Based Learning (PBL) is infused into the classrooms. Teachers and students are work collaboratively to expand their knowledge and present it in unique ways. In preparation for new PBL projects on the horizon, we like to collaborate with our families and community members to share their skills, interests and real-world experiences with our students! View our video to learn more! Please take this survey if you interested in partnering with us! Visit our calendar for upcoming events! The link is located on the left hand side of this page in the Upcoming Events block. Scroll down the page to see our Announcements, Spotlight, and Mission tabs! They contain very important information. Don't see what you are looking for? Still have questions? Please click on the "Contact" button at the top of this page to send an e-mail to Mr. Carney. He will address your request as soon as possible. Please know that your child's health and safety is our number one concern here at Gulf Beaches Elementary School, and throughout the Pinellas County School System. In order to help keep your child safe the school system has now put into place safety protocol, including drills to be prepared if we ever had an active assailant on campus, or in the surrounding neighborhood. Please understand that these plans were created by the school system and local law enforcement agencies working side by side. Please use the link below to be directed to the PCS Safety and Security webpage, there you will find the video which will be shared with all staff throughout Pinellas County Schools. Please contact your child's teacher if you have further questions or concerns. The Annual School Financial Report has been posted to the district website. Florida Statutes require each school to distribute this report to their parents as soon as possible. Visit https://www.pcsb.org/Page/23944 to view the reports. *Safety Concern: Our campus is not open to students until 8:15 am, unless your child attends a pre-approved morning club or meeting. The YMCA is available, on-site, at a cost. Students are not to be dropped off for school in the front parking lot. Students who arrive after 8:45 am must be walked into the front office by an adult and signed in. *In order to preserve student learning time, breakfast will not be served after 8:35 am. Students are expected to be present in classes no later than 8:45 am. Please adhere to all posted speed and STOP signs especially at peak arrival and dismissal times. *The GBEMS School Advisory Council has created a Magnet Agreement. This agreement is signed by all students and families each school year and the specified terms will be upheld. Please visit the SAC page for more information and to view the forms. *Gulf Beaches Elementary Magnet School Car Magnets are on sale through the PTA in the Front Office. They are $3.00 each and look exactly like the circular logo at the top of this page. If you are interested in purchasing one, please visit the office. Please pay using cash and exact change only as we cannot make change. Thank you. *Please send in Box Tops, Campbell's Soup Labels and Coke Rewards with your students as you collect them. These are a great way for us to earn money for our school! The mission of Gulf Beaches Elementary Magnet School is to educate and prepare each student for college, career, and life.